From contemporary hair designs to classic coiffes, Paradigm have long had an eye for the latest beauty and hair designs. We believe your hair should not only compliment your lifestyle, but actually become the very focal point of your personal style. We also offer hair designs for men, bridal hair design and pamper parties. The Brazilian Blow Dry is a revolutionary new treatment that results in smooth, silky, straight hair without the damage caused by heat styling. It eliminates frizz, and promotes lasting manageability while protecting against humidity and rain. The treatment conditions and protects while delivering effortless care and styling for 3-4 months. Our unique brand of Brazilian Blow Dry is very popular with our clients, who come from far outside the Haslemere area for their treatment. As well as offering superior results, you can wash your hair as soon as 3 hours after treatment. Hair extensions are a great way to add thickness and length. We pride ourselves on using only the very best materials and methods. Therefore we use the best quality 100% Russian human hair. We then use mini micro rings which are the most undetectable method and are also the kindest to your hair as there is no glue, heat or braiding required. We colour match to almost all colours including ombré, mixed colours and fashion colours which are great to add bright colours to your hair without any bleaching or drying of your own hair. 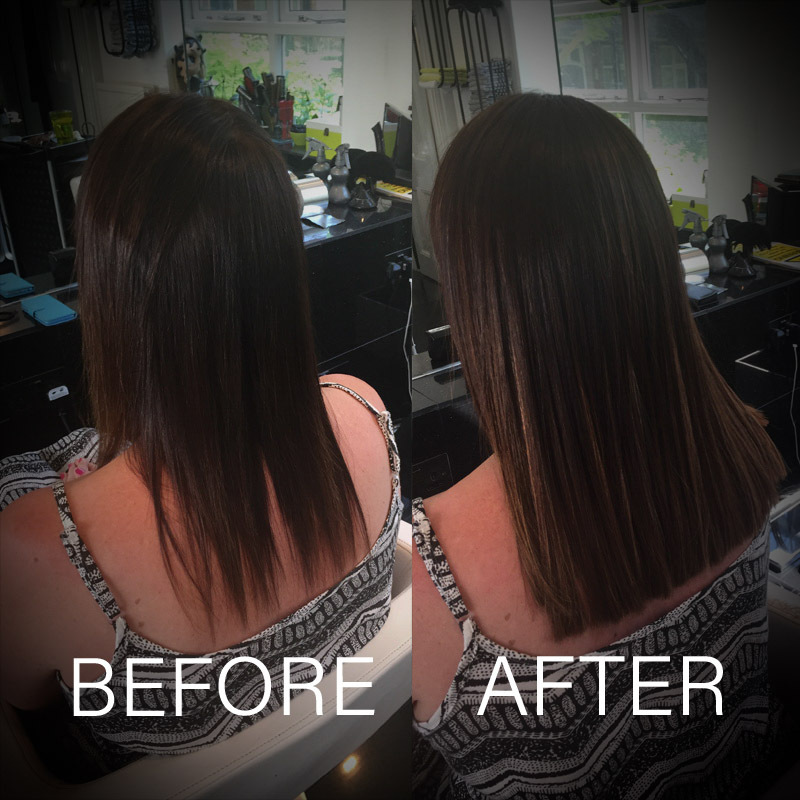 Being a hair salon that specialises in hair extensions means that we can provide cutting and styling of the hair extensions, as well as maintain your own hair in between to ensure that your own hair is still looked after. Booking information: All bookings made must be followed up with a consultation where we colour-match your hair and discuss how to maintain your hair extensions, along with a £100 deposit paid on the consultation to secure the booking.